Six male crossbred (Thai Native x Anglo Nubian) goats, 33.5 ± 1.7 kg body weight (BW), were randomly assigned to a 3 x 3 replicated Latin square design to investigate the effects of fungal-treated oil palm fronds (FTOPF) on feed intake, digestibility, ruminal fermentation and nitrogen utilization. The treatments were untreated oil palm frond (UOPF; T1), fungal treated oil palm frond (FTOPF; T2) and fungal treated oil palm frond with urea 1% (FTOPFU; T3). The results revealed that voluntary feed intake was not significantly different among treatments, while digestion coefficients of nutrients (DM, OM, CP, NDF, and ADF) increased significantly with FTOPF. However, the mean ruminal temperature, pH, NH3-N, blood urea-nitrogen and amount of N absorbed and retained were similar among treatments. In conclusion, FTOPF could be included in total mixed rations without any adverse effect on feed intake, digestibility and rumen fermentation efficiency, suggesting that FTOPF could be used potential as an alternative roughage source for ruminants. The increasing expansion of the oil palm industry over the past few years all over the world has led to the accumulation of agricultural by-products such as leaves and petioles, called oil palm fronds (OPF) (Rahman et al., 2011). The utilization of OPF, a cheap and abundant by-product of the oil palm industry, has received particular attention lately in many tropical countries, such as Indonesia, Malaysia and Thailand, owing to its potential to be utilized as a roughage source or a component in complete diets for ruminants (Zahari & Alimon, 2005). However, the use of OPF in livestock production is limited owing to its complex fibre structure and poor metabolisable energy value (4.9 - 5.6 MJ metabolisable energy [ME]/kg dry matter (DM)) (Ishida & Abu Hassan, 1997; Zahari & Alimon, 2005), as well as the fact that lignin constitutes 20% - 20.5% of its dry biomass (Abdul Khalil et al., 2006). Lignin can be considered as an anti-nutritional factor, limiting feed digestibility. In order to break down the lignocellulosic bonds and increase bioavailability of nutrients, various physical and chemical delignification methods have been examined in agricultural by-products such as in rice and wheat straws (Hamed & Elimam, 2010; Shah et al., 2017a;b). However, those methods are expensive, have a low effectiveness and are not environmentally friendly. The possibility of biological methods of treating roughages, e.g. using white rot fungi (WRF) (Jalc et al., 1996) to improve its quality, has great appeal as an alternative to the use of corrosive and polluting chemicals. Additionally, colonization with WRF is considered to be a promising technique because of its preferential degradation of lignin (Moyson & Verachtert 1991; Okano et al., 2009). In addition, improving the utilization of low quality roughages could be achieved through their treatment with nitrogen (N) sources. Wanapat (2000) reported that urea-treated rice straw could increase overall intake and digestibility, which thus resulted in enhancing the performance of ruminants as compared to untreated rice straw. Therefore, this study was conducted to investigate the effect of fungal treated oil palm fronds without or with urea on feed intake, digestibility, ruminal fermentation and N utilization in goats. A Lentinussajor-caju strain, provided by the Biotechnology Research and Development Office, Department of Agriculture, Thanyaburi, PathumThani 12110 Thailand, was used to inoculate oil palm fronds (OPF). The OPF was provided by the Faculty of Natural Resources, Prince of Songkla University, Hat Yai Campus, Songkhla 90110, Thailand. The preparation of fungal treated oil palm frond (FTOPF) was briefly as follows: Fresh OPF was chopped into pieces, 1 - 2 cm in length, and air dried at ambient temperature (30 -35 °C), was packed in plastic bags (30 x 45 cm) and autoclaved at 100 - 102 °C for 2 h and then cooled down at room temperature (28 - 32 °C). The autoclaved OPF were inoculated with sorghum grain spawns of Lentinussajor-caju cultures at a rate of 4% w/w (fresh weight basis) and re-packed in plastic bags. The culture bags were transferred to a fermentation room and incubated for 21 days at room temperature for full colonization of the mushroom mycelia on the substrate. After 21 days of incubation, all bags were removed from the fermentation room and the OPF substrates were sun-dried for 3 - 5 days (Fazaeli et al., 2004). The air-dried spent OPF was packed in plastic bags (45 χ 90 cm) and stored at room temperature pending the investigation. Six crossbred (Thai Native x Anglo Nubian) male goats, 18 months old with an average body weight (BW) of 33.5 ±_1.7 kg, were randomly assigned to the dietary treatments in a 3 x 3 replicated Latin square design. The treatments were: untreated oil palm frond (UOPF; T1), fungal treated oil palm frond (FTOPF; T2) and fungal treated oil palm frond with 1 % urea (FTOPFU; T3). All OPF were included in total mixed diets at a 30% inclusion rate (Table 1). The diets were formulated to provide the nutrient allowances to meet or exceed the NRC (1981) requirements of growing goats. All goats were kept in individual pens (0.115 x 0.95 m) under well-ventilated sheds where water and mineral block were available at all times. Mineral block (10 kg) containing 5% phosphorus, 5% magnesium, 3.7% calcium and 20% sodium 20%, as well as all the essential trace elements necessary for the goats, such as iodine (600 mg), selenium (50 mg), copper (3 500 mg), cobalt (100 mg), zinc (3 000 mg) and manganese (1 000 mg) were provided. The experiment was conducted for 3 periods and each period lasted for 21 days. During the first 14 days of each period, all animals were fed the respective diets ad libitum and during the last 7 days the animals were moved to metabolism crates for total tract digestibility studies. Feed was provided twice daily in two equal portions at 08:00 and 16:00. Feed offered and refusals were collected and weighed daily before feeding for daily dry matter intake (DMI) determinations over the last 7 days. 100 - moisture (%) - crude protein (%) - ether extract (%) - neutral detergent fibre - ash (%). Urine samples were analysed for urinary N using the Kjeldahl procedure described by the AOAC (1995) for calculation of N utilization. At the end of each period, ruminal fluid was collected from each goat by using a stomach tube at 4 h-post feeding. Fluid samples were strained through 4 layers of cheese cloth, and temperature and pH were measured immediately, using a pH meter (HANNA instruminalts HI 98153 microcomputer pH meter, Singapore) fitted with a combined electrode. The rumen fluid of 30 mL was then acidified with 3 mL of 1 M H2SO4. The mixture was centrifuged at 16 000 χ g for 15 min, and the supernatant was stored at -20 °C for ammonia nitrogen (NH3-N) analysis using the micro-Kjeldahl methods (AOAC, 1995) and volatile fatty acid (VFA) analysis by using HPLC (Samuel et al., 1997). Blood samples (about 10 mL) were collected from a jugular vein (at the same time as ruminai fluid sampling) into tubes containing 12 mg of EDTA, and plasma was separated by centrifugation at 2 500xg for 15 min at 5 °C and stored at -20 °C until analysis for blood urea nitrogen (BUN) according to the method of Crocker (1967). On the last day of each period, the goats were moved from the metabolism crates to their individual pens for the adaptation of the next diet period for 14 days. Tk, the mean effect of treatment (k = 1, 2, 3), and εijkl, the residual effect. Treatment means were statistically compared using Duncan's Multiple Range Test (Steel & Torrie, 1980) to identify differences between means. The feed ingredients and chemical composition of the experimental diets are presented in Table 1. The UOPF source contained high fibre levels. However, fungal treatment of OPF with/without urea (before mixed into diet) decreased NDF, ADF and ADL when compared to control group. The lower NDF and ADF levels following fungal treatment might be an indication of cell wall breakdown due to Lentinussajor-caju. Generally, NDF and ADF (3 and 9 wks colonization) levels of OPF decreased when colonized with WRF (Rahman et al., 2011). Similarly, decreases in the levels of these fibre fractions were also reported by Jalc et al. (1996) and Fazaeli et al. (2006) for wheat straw colonized for 2 - 4 wks with P. ostreatus, madake bamboo colonized for 10 wks with C. subvermispora (Okano et al., 2009), OPF colonized for 3 - 9 wks with C. subvermispora (3 wks) and L. edodes and P. brevispora (9 wks) (Rahman et al., 2011). The above results thus suggest that fungal fermentation improved the nutritive value of the straw by lowering its cell wall content. It has been widely reported that high ADF and/or lignin levels result in a low digestibility of feed (Vadiveloo et al., 2009; Sarnklong et al., 2010; Shah et al., 2017a; b), especially the lignified cell walls because of a low fermentation rate and digestibility, which lead to a low rate of disappearance through digestion or passage, and thus limited feed intake. Structural modification of cell wall components due to the respective urea or fungal treatment appears to facilitate fibre-degrading microbes in the rumen to degrade fibrous components more intensively, therefore increasing the digestibility of the feed (Wanapat, 2000). 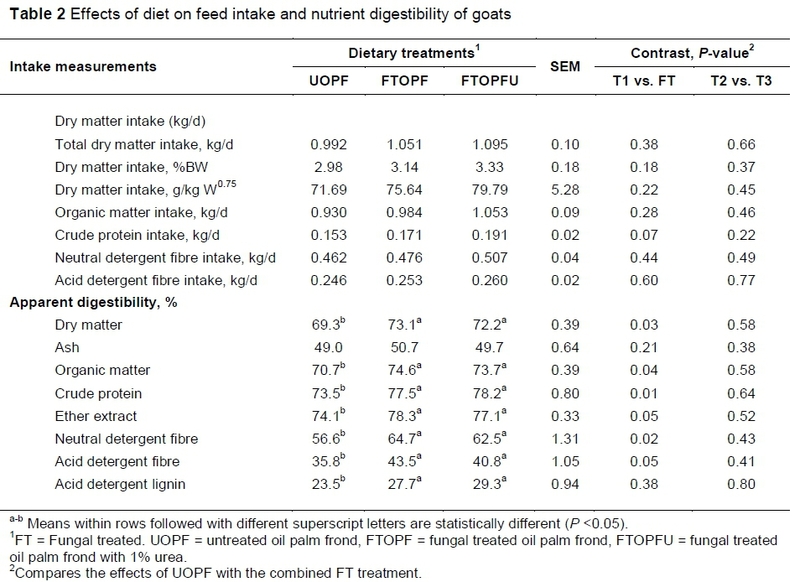 Table 2 shows that the overall means of total intakes of DM, OM, NDF and ADF of each goat were not affected by dietary treatments, while CP intake tended to increase in goats that were fed FTOPF and FTOPFU (P = 0.07). On the other hand, total tract digestibility of DM, OM, CP, NDF, ADF and ADL were significantly (P <0.05) increased in goats receiving FTOPF or FTOPFU. The higher nutrient digestibility of the treated OPF diet might be explained by the lower NDF, ADF and ADL levels compared with UOPF. These results are supported by Fazaeli et al. (2002), who reported that nutrient digestibility of fungal-treated wheat straw diet was equal to that of the alfalfa diet when it constituted up to 30% of the diet of lactating cows. Similar to the present results, Fazaeli et al. (2004) found that total tract digestibility of DM, OM and gross energy were increased in bulls fed fungal-treated wheat straw. This was also found by Kafilzadeh et al. (2009), who investigated sheep consuming Pleurotusflorida-treated date palm leaves. Similarly, Mahesh et al. (2013) found that feeding wheat straw supplemented with Crinipellis sp. to Sahiwan calves resulted in an increase in the nutrient digestibility, and it was concluded that solid state fermentation with Crinipellis sp. has the potential to upgrade the nutritive value of wheat straw. 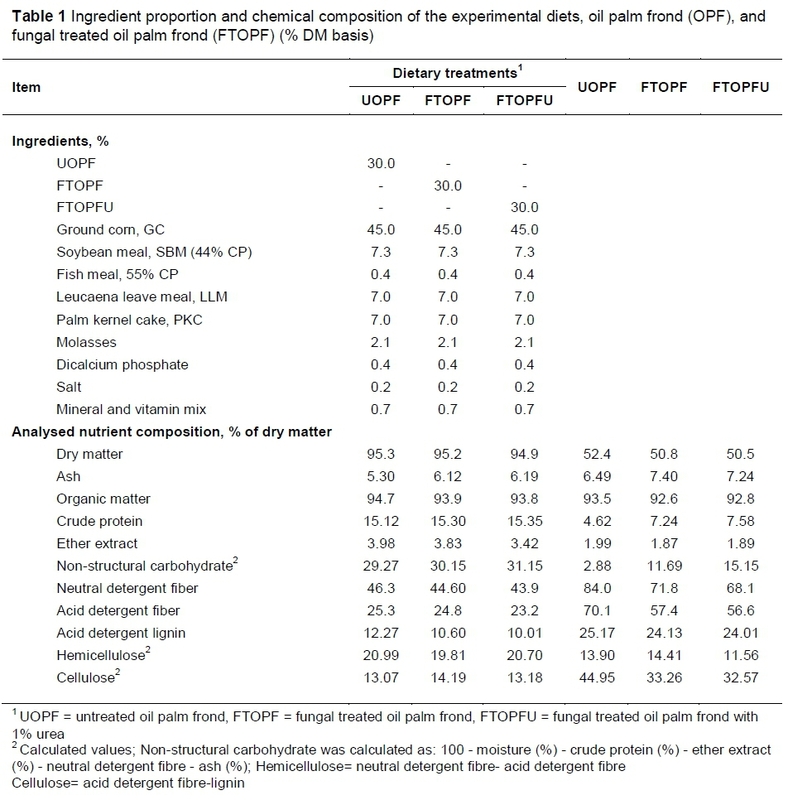 The effect of fungal treatment of OPF on the patterns of ruminal fermentation is given in Table 3. The ruminal pH and temperature ranged from 6.48 to 6.53 and 39.2 to 39.3 °C, respectively, and were not significantly different among treatments, and the values were within the optimum range for cellulolytic bacteria activity (Cherdthong et al., 2011) and digestion of protein (pH = 6.0 - 7.0). A high pH is favourable for bacterial adherence, an important prerequisite for fibre digestion (Simon et al., 2005; Palmonari et al., 2010), while a pH < 6.1 could inhibit cellulolysis (Wanapat, 2000). Similarly, NH3-N (19.52 - 21.43 mg/dL) and BUN (17.69 - 20.65 mg/dL) concentration were similar among treatments and were in an optimal range > 5 mg/dL for microbial protein synthesis (Satter & Slyter, 1974) and 10 to 20 mg/dL for optimum degradation of fibrous feed (Preston & Leng, 1987). According to Erdman et al. (1986), maximum DM digestion of low and high degradability feed occurred at ruminal ammonia concentrations of 170 and 250 mg/L, respectively. The higher rumen NH3-N concentration in the FTOPFU treatment was due to urea being the supplemental source of N. Meanwhile, BUN concentration was similar among treatments, ranging from 17.69 to 20.65 mg/dL. It was close to the optimal level in normal goats, which had been reported in the range of 11.2 to 27.7 mg/dL (Lloyd, 1982). There were no differences among treatments in total ruminal VFA concentration, molar proportions of acetate (C2), propionate (C3), butyrate (C4) other VFAs (isobutyrate, isovalerate, valerate and caproate), and the ratio of acetate to propionate (A:P). However, total VFA concentration tended to increase at 4.3 mmol/L for goats that were fed FTOPF as compared with UOPF (P = 0.09). Karunanandaa & Varga (1996) found that a fungal (Cyathus stercoreus) treated rice straw diet increased total VFAs and proportion of C3 and C4. In another study, Tripathi et al. (2008) found that bio-processed mustard straw with C. versicolor (21 days) increased rumen pH and total VFAs in sheep after 6 h of feeding. In this study, the total VFA concentration ranging from 70 to 130 mM was similar to the finding of Hungate (1966) and France & Siddons (1993). However, total VFA concentration in the rumen depends on factors such as digestibility, rate of absorption, rumen pH, rate of passage from rumen to other parts of the digestive tract, as well as the microbial population in the rumen and their activities (Hungate, 1966). 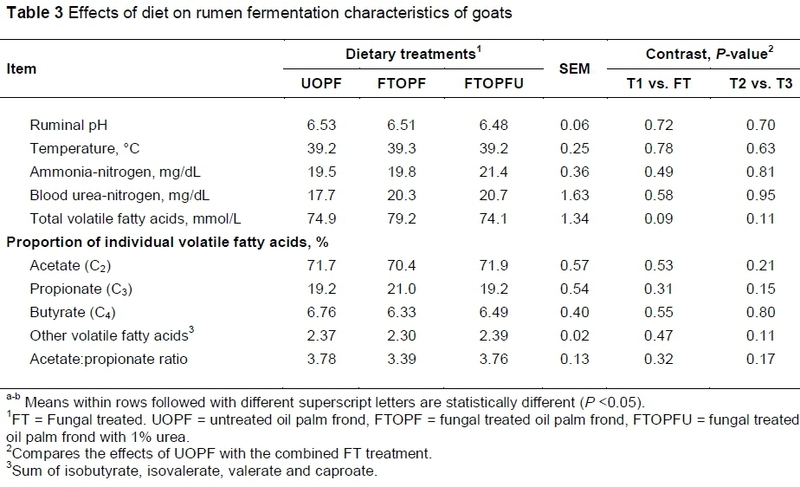 In addition, concentrations of branched-chain VFAs (isobutyrate and isovalerate) and valerate of the rumens of the goats were not adversely affected by dietary treatments. Table 4 illustrates the effect of treated OPF on N utilization in goats. Total N intake and total N excretion in terms of faecal and urinary N were similar (P >0.05) among treatments. However, total N intake of goats that received treated OPF tended to be higher than that of the control group (P = 0.08), which could be due to the higher DMI in the treated OPF (4 - 8 g/kg W0.75) groups compared with UOPF. This pattern of faecal and urine excretion is indicative of the extremely high N intake for goats fed diets containing FT. Additionally, Cronje (1992) found that inadequate energy reduced the percentage of N retention in goats fed adequate levels of protein, and N recycling increased as the supply of energy increased. Likewise, the amount of N absorbed was increased through feeding treated OPF (P = 0.03), while N retention did not changed among treatments (P >0.05). It was postulated that the greater N absorption was related to higher water-soluble carbohydrates (WSC) and lower fibre concentration in the treated OPF group. Okano et al. (2009) reported that cellulose, hemicelluloses and lignin are the main sources of carbon and energy for the growth of white-rot fungi. Therefore, mycelial proliferation by all the Lentinussajor-caju on OPF was possibly due to their saprophytic ability to solubilize structural carbohydrates and their ability to extract fibre bound N for their metabolism and growth (Jalc et al., 1996). The results provide little evidence that an increase in the synchrony between energy and N release in the rumen, which may be achieved by feeding treated OPF of higher WSC concentration, would improve microbial protein synthesis in the rumen. Hence, the positive N balance observed in the present study indicates that all diets supplied sufficient N to the goats. Based on this investigation, fungal treatment of OPF has no effect on feed intake, ruminal fermentation patterns and N balance of goats, but it improved the digestion coefficients of nutrients. It is suggested that FTOPF could be effectively used as a roughage source in total mixed rations. However, further research and long-term studies on the feeding and the economics should be conducted to validate the effects of fungal-treated OPF in the performance of finishing goats in terms of both meat and milk. The authors would like to express their most sincere gratitude and appreciation to the Department of Animal Science, Faculty of Natural Resources, Prince of Songkla University for financial support of this research (Project no. NAT570154B). This work was also supported by Increase Production Efficiency and Meat Quality of Native Beef and Buffalo Research Group, Khon Kaen University and the Thailand Research Fund (TRF) contract grant IRG5980010. PC conducted experiment, analysed data and wrote the manuscript. VP edited the manuscript. AC edited the manuscript. All authors read and approved manuscript.